Here it is, my original boxed set. 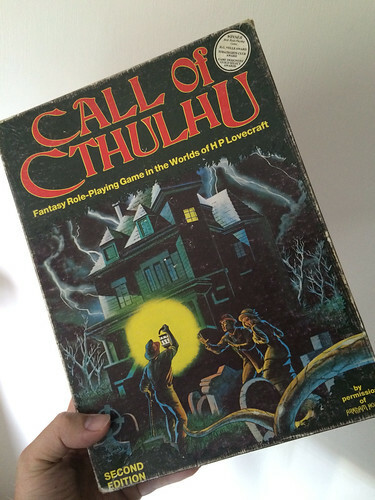 The first RPG I Gamesmastered was 2nd Edition Call of Cthulhu, using the UK boxed set version printed by Games Workshop. From recollection, the first scenario was The Haunted House which is part of the core rules and pretty much a classic. I can’t remember if I played it with my friends Mandy, Louise and James who lived across the road, or if I first ran it at school. If it was the former, then I can remember it all going horribly wrong in the sense that the characters pretty much went mad or got killed. This scenario was also the one that I tried with my father when away in France Eurocamping. He took a very direct approach and blew up the haunted house, figuring that as the contract with the landlord of the house was to resolve this issues then that met the needs. I much later found out that my dad didn’t really like the horror genre at all. I would have run Basic D&D first, but when I went to buy that, it had disappeared from the local toy and gift shop so I ended up consoling myself with a copy of Steve Jackson’s Ogre Microgame. Ogre has remained a game I love, and I recently took part in the Kickstarter 6th Edition release. This arrived when I was away in Hamburg and was so big that it was a struggle for Jill, Nathan and Aidan to lift between them!